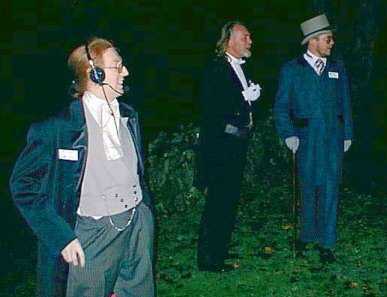 One of the nice things about a Victorian Freeform is the opportunity to wear really smart suits. Modelling 1888's latest fashions, from left to right - the Ghoul Robert Lees (Ian Crowther), Deacon Brodie of Edinburgh (Robin Allen), and Master Lucas van Oysten, of the Waterloo Tremere Chantry (John Davies, Egad!). The ever-smiling Tremere Primogenitor, Necesse Est (Ross Bennett), confident in his easy authority over the Clan in London. 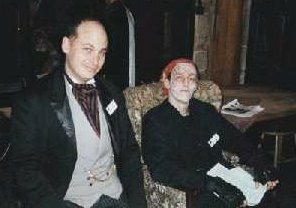 Behind him sits Spider Joey (Andy Elliott-Williams), of Clan Gangrel, a traveller with circuses and fairs and a romantic at heart. 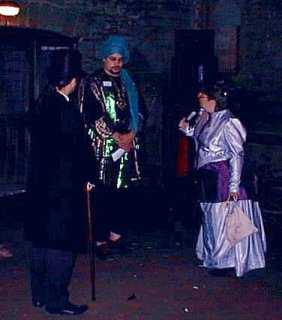 One of the more colourful individuals at the meeting, the Nawab Nataraja of Calcutta (Laurents Driver), here deep in conversation with Signor Giamatteo di Giovanni (Nick Coopey, swathed in darkness on the left of our picture) and Countess Berenice Oradea, of the Tzimisce (Anne Macey). Actually, the Nawab seems a little put-upon here. Difficult questions, perhaps?